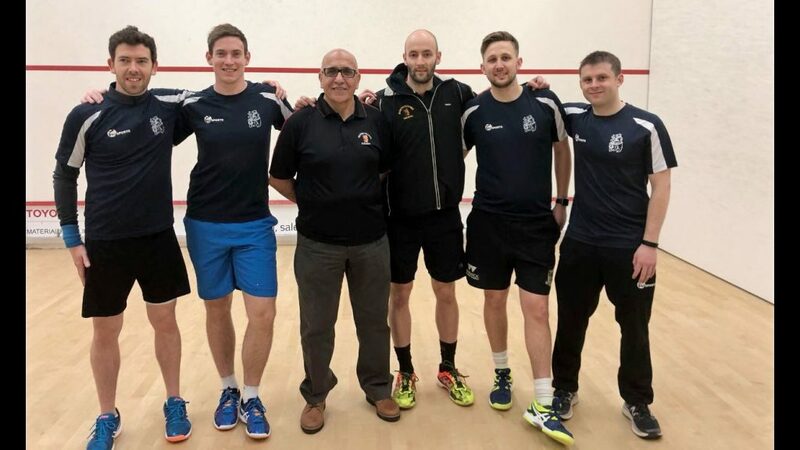 Warwickshire men’s team travelled to Nottingham at the end of April to take part in the National Inter-County finals held at Nottingham Squash Club. The event saw the top 8 County sides battling it out to be crowned the best in the England. The team was made up of Jaymie Haycocks, Chris Hall, Guy Pearson, Jason Pike, Neil Stanuton and Hassan Khalil. The men’s side started off with a tricky tie against Essex. First on were Kenilworth coach Guy Pearson at 3rd string and Leamington’s Neil Staunton. Neil never quite hit his stride against an impressive Joe Blackmur, who always had a slight lead on his way to a 3-0 win over Staunton. Guy took on ex professional Rory Pennell in what was one of the matches of the weekend, both players showing their quality in a tussle that went down to the wire. Pearson bravely winning in five on a reverse angle boast. Sutton professional Jaymie Haycocks took on the improving Owain Taylor and quickly found himself a game down before steadying the ship to come back with a 3-1 win. Meanwhile Leamington coach Jason Pike was embroiled in a mammoth tussle against the young Aaron Allpress, Pike using all of his skillset to sneak a win 11-9 in the fifth. Sutton’s Chris Hall was up against the talented Youseff Abdalla who fired in some outstanding shots to take a 1 game lead. Hall fought back to take the next three games with some steady squash despite moments of brilliance from Aabdalla. A strong Sussex side were the opposition in the semi-final led by the experienced Tim Vail. Pearson and Staunton were up first against two of Englands top juniors Curtis and Perry Malik respectively. Staunton gave his all but could not quite make enough of an impact against Perry, going down in straight games. Pearson took the first only to be pegged back to one game all. He thought he had taken the third on a stroke but a controversial decision denied him the game and he lost out in a narrow 14-12. Starting to show the effects of his early 5 setter, he was not able to pull things back and lost out 3-1. Haycocks took on the mecurial Vail and like the morning’s match, found himself a game down with Vail also taking the second to establish a commanding lead. Haycocks was not about to give up easily and fought back superbly to three tight games and with it a 3-2 win. Like Pearson, Pike was also feeling the effects of his earlier match as he took on another youthful opponent in Lucas Hughes. The Leamington man taking the first but not quite being able to maintain the pace, losing 3-1. In the dead rubber Hall lost out to rising prospect Tom Walsh 2-0. Hassan Khalil came in on the Sunday to make his senior Warwickshire debut, replacing the unavailable Staunton. He put up a good showing against fellow junior Jack Mitterer, taking the first before Mitterer’s greater experience took hold, the Warwickshie junior losing out 3-1. Pearson was playing the equally talented Ted Jeal and both were in no mood to hang around, Jeal coming out the victor in straight games. Haycocks took a game but lost out to the fast rising Josh Masters in an entertaining affair. Pike took on former PSA player Steve London and put up a brave fight after his battles the day before, but went down in 3 close games. Hall took out Bradley Masters in straight games with the Warwickshire man slightly more willing to rally after the Saturday night social.